World Heavyweight Champion Anthony Joshua Presented With Ooni Of Ife’s Official Congratulations By Larry Ekundayo In London. Nigerian boxing hero, Anthony Joshua, was touched and humbled to receive the Ooni of Ife’s official congratulations on his recent, dramatic unifying of the World Heavyweight Championship. The Yoruba King was the first Nigerian leader to officially have his congratulatory letter hand delivered and recognised by Anthony Joshua. Recall that the Ooni already blessed, endorsed and supported other Nigerian boxers (Larry Ekundayo and Olusegun Ajose), a fact which did not go unnoticed by the Heavyweight King. The Champion, who is very proud of his Nigerian roots, was touched by the personal letter, and he expressed a genuine interest in hearing how Nigeria had gotten behind him for his recent win. 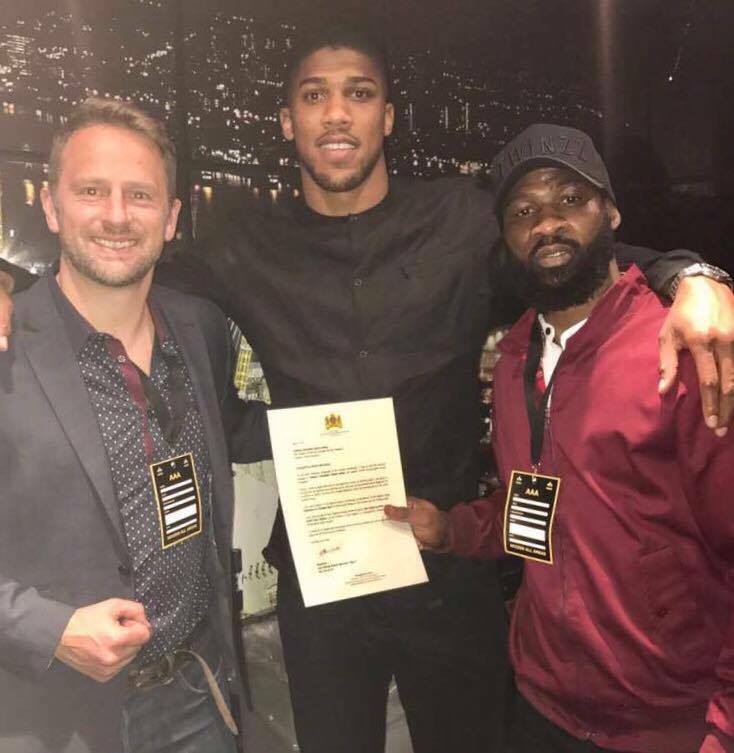 The letter which was facilitated by Nigerian Lawyer – Bob Olukoya Esq., was hand delivered to AJ by elite Nigerian fighter, Larry Ekundayo and Ben Gray, the Commercial Agent for Nigerian boxers recognised for specialising in helping Nigeria to deliver on its huge wealth of boxing talent. Reading it several times, Anthony beamed at its contents and was obviously honoured to receive it, even promising to frame the letter and put it on his wall at home! He looked forward to one day meeting the Ooni in person. Joshua and his team are already in early discussions with World Class Athletes based in London to visit Nigeria on an official tour of the country, so there is every chance that the Heavyweight King will be meeting the King of the Yoruba people in the near future. Anthony encouraged all Nigerians to get behind their boxers, especially Ekundayo, ahead of his forthcoming Commonwealth title bout and even recorded a special, personalised message for Larry, which will be released in the coming weeks. Finally, after delivering the letter Ben Gray said “It was wonderful to be able to help promote Nigeria in this way, and Anthony and his team couldn’t have been more welcoming to us because they know how we have helped represent Nigerian boxing. Now that the Ooni of Ife and the Alaafin of Oyo have led the way I hope that Nigerians everywhere will recognise the huge asset that Anthony and other Nigerian boxers are to their country. This is particularly valuable to the country in helping create positive news stories about Nigeria on the international stage, and as a result, I hope we will see proper support of your incredible, world class talent”.